Join us as we celebrate our 20th Anniversary and honor our friends and supporters, EY, Long Island. Enjoy live music from Steel Impressions, dancing to our favorite DJ, raffles, delicious food catered by Iavarone Brothers, wine, beer, dessert and special activities for children. 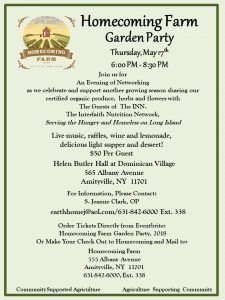 This is our premier fundraising event and unlike any other, filled with laughter, love and gratitude for a beautiful growing season caring for creation and supporting The INN.